This Rooster will certainly wake up your amp in a vintage-inspired fashion. Rangemaster-style sound with extra tonal options, thanks to the frequency switch. Well-made. 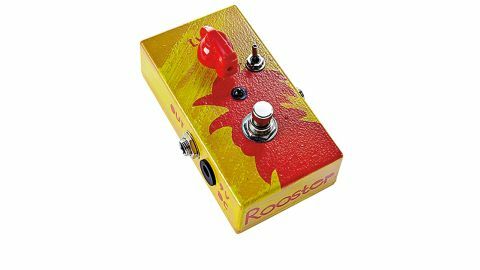 The Rooster from Greek effects firm is a treble booster inspired by the Dallas Rangemaster, used by Rory Gallagher, Brian May, Tony Iommi and, perhaps most famously, by Eric Clapton on the Bluesbreakers' 'Beano' album. "The Rooster will excite the top-end frequencies of an overdriven amp"
JAM has strived to get the vintage sound right by calling on the services of the CV7003 transistor - the original Rangemasters also made use of the OC44. As well as a knob to dial in the amount of boost, starting with unity gain at about 12 o'clock, you get a three-position switch that focuses the frequency range of the boost. The bass setting is more of a full-range fat- sounding boost, while treble loses some bottom for a brighter presence, and mid is between the two. Whatever setting of the switch, the Rooster will excite the top-end frequencies of an overdriven amp, bring out the harmonics and send sustained notes into singing feedback.